Unknown risk can create considerable concern and worrying. However, known risk can be a secret weapon - empowering you to avoid wasteful spending and allocate resources more effectively. 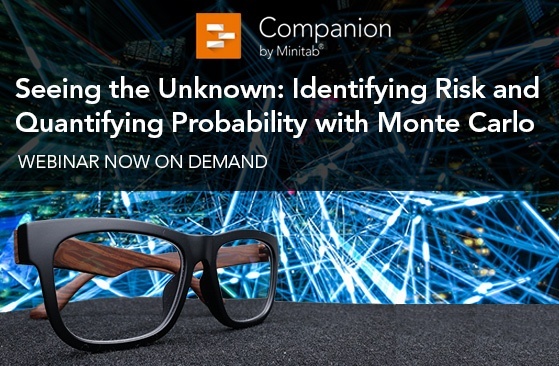 Monte Carlo simulation in Companion by Minitab can help you foresee the variety of outcomes likely to occur when you alter different variables. Ensure products meet their intended specifications by studying the process inputs and developing a (y=f(x)) equation that describes the process. Take the equation further by considering the uncertainty in the inputs - which results in a more realistic view of the response. Perform Monte Carlo simulation to predict process capability, and to identify the best strategy to determine optimal process settings using parameter optimization and sensitivity analysis.